Home » Exercise » Resistance Training: The Secret to Reverse Age-Related Memory Loss? Resistance Training: The Secret to Reverse Age-Related Memory Loss? However, it might be time for a new perspective. There is a growing body of research indicating that as much as lifting weights can improve physical health, it can do just as much—or more—for your aging brain. Resistance training exercises or weight lifting could actually help older adults retain memory and improve their decision-making. 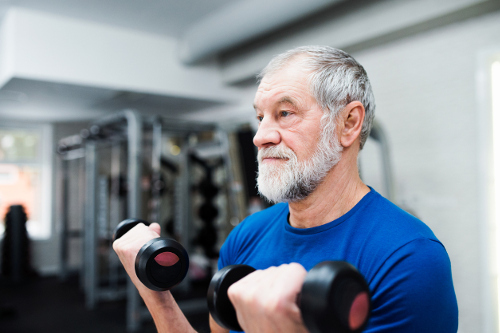 For example, a recent study published last October showed that people aged 55 and older experienced significant benefits to memory and decision-making following a resistance training program. A total of 100 participants who suffered from mild cognitive impairment took part in the study. As part of the randomized, double-blind, controlled trial, participants were assigned either to a legitimate progressive resistance training program two to three times per week or a “fake” program where progressive resistance was not used. Participants also underwent computerized cognitive training and testing. Progressive training is the most effective way to build strength and muscle, and apparently, also the best for maintaining memory and decision-making. The formula is rather simple: as your body gets stronger, simply increase the weight of your lifts so that you’re performing the same number of repetitions or more with heavier weights. At the end of the trial, the participants assigned to resistance training showed a significant increase in their capacity to make sound decisions, as well as improved memory recollection. Another victory for resistance training! Weight training, of course, is not the only form of exercise that has benefits for the brain. Physical activities like jogging, dancing, walking, and cycling are all associated with improved brain function, but it just so happens that results might be best with weight training. Starting a successful resistance training program—or any form of exercise program—requires commitment and confidence. But once you decide to take the plunge and learn how to work out effectively, the sky is the limit! Brink, W., “Resistance Exercise Reduces Cognitive Decline,” Life Extension, May 2017; http://www.lifeextension.com/Magazine/2017/5/Resistance-Exercise-Reduces-Cognitive-Decline/Page-01, last accessed July 10, 2017. Mavros, Y., et al., “Mediation of Cognitive Function Improvements by Strength Gains After Resistance Training in Older Adults with Mild Cognitive Impairment: Outcomes of the Study of Mental and Resistance Training,” Journal of the American Geriatrics Society, March 2017; 65(3): 550-559. DOI: 10.1111/jgs.14542.